Sri Lanka Amateur Baseball / Softball Association is proud to announce that the 01st WEST ASIA BASEBALL UMPIRING CAMP was successfully concluded in Colombo with a closing ceremony attended by all the participants of the event. This was held on the 16th & 17th and the Camp Trainers and the overseas umpires arrived in the country on the 15th and departed on the 18th and 19th. All participants were received good training and individual attention was paid by the Training panel. Mr.Koji Aso, Chairman Rules and Umpiring Committee of BFJ conducted the Camp and assisted by Mr.Shinnou Yutaka and Mr.Sujeewa Wijayanayaka. 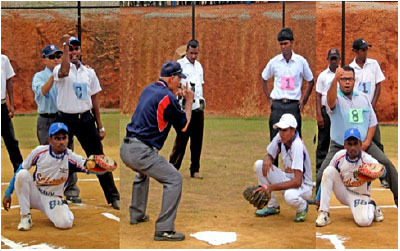 The two day Umpiring Camp was attended by umpires from India, Pakistan, Nepal and Iran in addition to the Sri Lankan Umpires. Mr.Calvin Yeh from the BFA training department and Mr.Koji Aso met the President of SLABSA Mr.Kalinga Indatissa and exchanged views in relation to developing the game in the region. All the participants were presented with certificates issued by the BFA at the concluding ceremony. Western Province Youth Affairs & Sports Minister Hon. Upali Kodikara was the Chief Guest at the closing ceremony and presented the certificates and souvenirs to participants.